This 15th August, we celebrated our 72nd Independence Day, remembering the avid contribution of our freedom fighters, by hoisting our National Flag at our headquarters, and at the offices of our Regional Councils and Branches. Personally, the realisation that our freedom fighters have given us such an exemplary virtue of freedom and liberty at the cost of even their existence, has been extremely overwhelming and motivating for me, and this should be for each and every Indian too. We must be grateful to them for their strenuous efforts they had put in, the fruits of which we are reaping today. This Day also inspires us to introspect and recall our own accountancy legends and their onerous hard work. Former President of India and noted educationist Dr. S. Radhakrishnan, whose birth anniversary we celebrate every year on 5th September as Teachers’ Day, had said: The end-product of education should be a free creative man, who can battle against historical circumstances and adversities of nature, i.e. all human knowledge systems must pave the way for the creation of a better world. And CA education system is no different. Since the profession’s inception in 1949, Chartered Accountants have been contributing their share towards the strengthening and enrichment of our national economy. I am sure, our coming generations too will continue to do that conscientiously, enriching our strong professional legacy. In personal capacity as well as on behalf of the Indian CA fraternity and ICAI Council, I offer my rich tributes to the legendary statesman Bharat Ratna and former Prime Minister of India Shri Atal Bihari Vajpayee, who breathed his last on 16th August 2018. With the perspective that individual empowerment would lead to the empowerment of our nation, he had said: ...empowerment is best served through rapid economic growth and rapid social change. 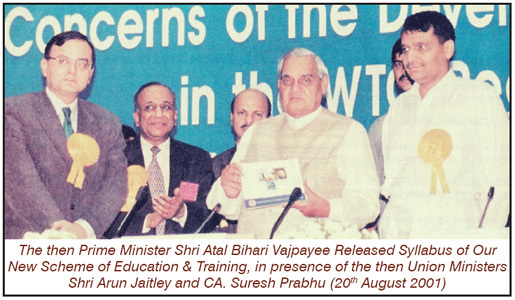 Speaking as Chief Guest at the inauguration of our Golden Jubilee Celebrations on 1st July 1998 in New Delhi, Shri Vajpayee had said: I must compliment the profession of Chartered Accountants for having served India well... The prestige your profession has acquired is on account of discipline, diligence and dedication which have become the hallmark of your profession. What is more is that you have been able to transmit that sense of discipline and diligence to much of the financial transactions of the Indian economy. Your profession had made rapid stride in the last few decades and your illustrious Institute has been spearheading the economic growth... 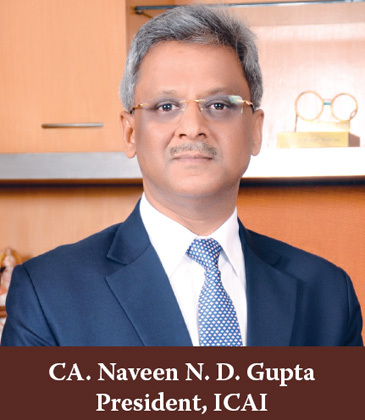 The Indian Chartered Accountants have succeeded in meeting the rapidly changing demands of the Indian economy in this era of liberalization and globalization. This could not have been possible without the institute laying special emphasis on continuous education and training of your members. This progressive mindset provides a model for other professions. Another feature of your Institute which pleases me is that it is perhaps the only Institute in the world which undertakes the complete range of activities relating to its members and students, and I am particularly happy to note that you have made special endeavours to articulate accounting and auditing standards and improve the quality of corporate functioning... These words of wisdom from one of the sages of Indian polity will keep inspiring us in the years to come. Then, we must seek inspiration from his supreme sense of righteousness and nationalism, which he had exclaimed through the following words: Game of power will go on. Governments will come and go, and parties will be born and disappear. But the country should remain safe and its democracy be immortal. Let’s join together in paying homage to this great leader of India. As all of you are aware, the people of Kerala have been facing existential crisis and battling the devastating natural calamity due to unprecedented rains and resulting floods that have brought the State to a standstill. This is the second-worst monsoon disaster since 1924. While more than 300 people have lost their lives, thousands of them are still feared stranded. Hundreds of homes have been wiped out and many more have been badly damaged. Multiple rescue teams, including government and non-government agencies, are operating round the clock to bring the life back to normalcy. I take this opportunity to appeal to my professional colleagues to contribute in the rebuilding of the lives of people of Kerala by donating to the ICAI Kerala Flood Relief Fund. Details in this regard have been published in this Journal. Employees of the Institute are also contributing to the Fund. Panel of CAs Sent to SEBI for Regulatory Inspection of Mutual Funds: Every year, SEBI conducts inspection of mutual funds under Section 61 (1) of the SEBI (Mutual Fund) Regulations, 1996. Till now, CA firms which were interested in conducting the inspection on behalf of SEBI, used to apply as per the eligibility norms regarding their empanelment with SEBI. This year, for the first time, SEBI approached ICAI asking for a panel of Chartered Accountant firms/ LLPs. Accordingly, a panel has been submitted to the SEBI. Let us welcome this development as this will pave the way for more professional opportunities for our members. Overseas Campus Placement in September: It has been our special endeavour to put brand India CA at the global pedestal. In that spirit, I am happy to inform that ICAI, for the first time, is holding overseas campus placement for its members on 14th-16th September 2018 through personal interview/ videoconferencing mode in collaboration with our Chapters abroad. Till date, 150 requirements/ vacancies have been received from various companies and accountancy firms abroad. The vacancies are expected to increase substantially towards the end of August, since many companies in the Middle East region will resume office after the holidays of Eidul- Adha. MoU with CPA Canada: I am happy to inform that the Union Cabinet chaired by Prime Minister has approved our MoU with the Chartered Professional Accountants of Canada (CPA Canada) towards the establishment of mutual cooperation framework for the advancement of accounting knowledge, professional and intellectual development, and interests of our members. Signing of this MoU will increase our members’ professional avenues in Canada, fostering strong working relations between the two accounting institutions. MoU with BIBF Signed: I also wish to inform that we recently signed an MoU with the Bahrain Institute of Banking and Finance (BIBF) of Bahrain. Under the MoU, we will work with the BIBF to strengthen the accounting, financial and audit knowledge base in Bahrain, providing technical assistance to them. On the same day, i.e. 30th July 2018, a members’ meet was also organised at the Bahrain Chapter. CA Jobs Portal to be Launched: I am really happy to announce that ICAI will launch a unique job portal, especially designed for its members on 31st August 2018, which will also help the recruiting companies in their selection and recruitment processes. Chartered Accountants may find all vacancies meant for them at this one-stop job portal, and the recruiting companies can access to the pool of eligible candidates available at the portal as well. I would request all interested members to check https://cajobs.icai.org for other details in this regard, from 1st September 2018 onward and get benefitted from the Institute’s services. Training on GST and Extending Resources: Recently a revised 6th edition of the Background Material on GST Act(s) and Rules was brought out that is updated up to 31st July 2018. Also, the third edition of E-Way Bill has been e-published. Moreover, ICAI Newsletter on GST is regularly being issued to update the stakeholders on GST. ICAI is regularly organising training programmes, seminars, conferences and live webcasts on GST, besides conducting a Certificate Course on GST. Interested members can register at http://idtc.icai.org/cc/apps/register-for-update for updates. A series of live webcasts on GST Audit were organised on 7th, 8th, 13th, 14th and 15th July 2018 for faculties and their recordings are available at https://www.youtube.com/ indirecttaxcommittee. Then, a series of 10 webcasts on GST were organised for students between 14th July to 12th August 2018. Mega IBC Conclave in Mumbai: ICAI along with the Indian Institute of Insolvency Professionals of ICAI (IIIPI) organised the Mega IBC Conclave on 11th August 2018 in Mumbai, which was attended by a large number of delegates, who belonged to places other than Mumbai as well. IBBI Whole-Time Member Dr. Navrang Saini addressed the delegates at the Conclave. More Recognition for CA Qualification: I am pleased to inform you that Patna University has recognized the Chartered Accountancy qualification as equivalent to their Master degree allowing our members to pursue their PhD Programme. Thus, so far, 103 Universities, 6 IIMs and 2 IITs (i.e. a total of 111 institutions) have recognized our CA qualification for pursuing the PhD programme. MCA to update KYC of Directors: ICAI has thoroughly supported the Government in its initiatives to update its registry, wherein the Ministry of Corporate Affairs would be conducting KYC of the Directors of all companies annually through a new e-form, viz. DIR-3 KYC. With a view to create awareness and popularise, ICAI has hosted the announcement at its website, and published that in Journal and at social media platforms. A live webcast was also conducted on the same on 6th August 2018. A mass email in this regard has been sent to all India members. I appeal to all the members who are Directors in companies to update their KYC suitably within the timeframe, i.e. 15th September 2018. At a seminar in Cuttack and Bhubaneswar, participants were briefed about this process and initiative. ILC Meeting on Cross-Border Insolvency: On behalf of the IIIPI (Indian Institute of Insolvency Professionals of ICAI), its CEO Shri Sunil Pant attended the ILC meeting on Cross-Border Insolvency held in New Delhi on 11th August 2018, handing over a preliminary presentation on the issues and suggestions on cross-border insolvency to the Ministry of Corporate Affairs, which was appreciated by the Ministry. Deliberations at the meeting were held on the Proposed Chapter on Cross- Border Insolvency within Insolvency and Bankruptcy Code, 2016 (IBC), among others. It was clarified that the Government intends to notify a Chapter on Cross- Border Insolvency, as a part of IBC, since the enabling Sections 234 & 235 of the Code (once notified) are not felt to be adequate. Proposed Amendments to IBC were also taken up towards strengthening of the inspection and investigation functions of IBBI. ICAI Stand on SEBI Consultative Paper: SEBI had issued a consultative paper on the proposed SEBI (Fiduciaries in the Securities Market) (Amendment) Regulations seeking public comments, wherein Chartered Accountants have been included in the definition of fiduciaries along with other professionals. In this regard, ICAI has submitted its suggestions and stated that the proposed Consultative Paper issued by SEBI goes beyond the powers of SEBI and there is no specific statutory provision under the SEBI Act conferring powers on SEBI to take action against auditors of listed companies. It has also been highlighted that the apex court of North Carolina (of USA) has decided that auditors/ accountants are not part of fiduciaries. Therefore, the Consultative Paper should not include the Chartered Accountants as fiduciaries. Report on Audit Quality Review (2017-18): As you know, the Quality Review Board has initiated a system of independent review of statutory audit services of the audit firms auditing accounts of the top listed and other public-interest entities in the country pursuant to a process comprising selection of the audit firms for review and engagement of technical reviewers. It has recently issued a Report on Audit Quality Review (2017-18) providing key findings and analysis of the observations made by technical reviewers in the review reports during the period. The report is available at http://www.qrbca.in/wp-content/uploads/2018/07/ qrb40447.pdf. Opening of 33rd Chapter of ICAI: After inaugurating our 32nd Chapter in Kuala Lumpur (Malaysia), we will inaugurate our 33rd Chapter in Tokyo very soon, spreading our professional horizon further. This will boost the morale of our members in Japan and provide them a platform to interact and network, facilitating in creating avenues for professional development. Spanish Courses for Members: First two batches of Spanish Course have been completed by 15 members. Further, two new batches (weekend) have been started in both Delhi and Mumbai. Release of Concept Paper on Blockchain Technology: In this phase of massive digital transformation, blockchain technology is among the most innovative global forces of disruption. ICAI has recently released a Concept Paper on Blockchain Technology – Adoption Trends and Implications for Accountancy Profession, which analyses the current macrotrends of blockchain ecosystem and the impact of technology on various industry/ sectors. Its focus is to identify the implications of blockchain technology on accountancy profession in particular and develop a way forward to evolve the current practices in accounting, assurance and advisory. Launch of Data Analytics Labs: I take pleasure to inform that we have recently inaugurated Data Analytics Labs in Chennai, Kolkata and Chandigarh to provide hands-on training to our members on latest software and CAAT tools. So far, we have set up 6 such labs. Such labs will help us produce experts who can conduct forensic accounting to check financial bungling and frauds by companies and financial institutions. Besides, such a step will also open up new professional avenue for our members in field of forensic accounting. Completely-Revamped Certificate Course on Internal Audit: ICAI has completely revamped the course structure for Certificate Course on Internal Audit, with the inclusion of new content, especially IT. The course aims to educate on the theory of internal audit, provide practical exposure on the design and conduct of internal audit using IT, explain current best practices and how to deploy these to mitigate risks, and address business challenges, among others. Publications for Limited Insolvency Examination: IBBI (Insolvency and Bankruptcy Board of India), under the regulation 3(3) of Insolvency Professionals) Regulations, 2016, has published the syllabus, format, etc., for the Limited Insolvency Examination to be conducted from 1st November 2018. For examination, candidates can register at https://ibbiliexam.onlineregistrationform.org/IBBI by selecting time, day and examination centre, which are available across the country, by paying their examination fee online on each and every enrolment. Five Standards on Internal Audit: ICAI has regularly guided members through Standards on Internal Audit. At its recent Council meeting, we approved five standards, viz. Standard on Internal Audit (SIA), Managing the Internal Audit Function; SIA, Conducting Overall Internal Audit Planning, SIA, Planning an Internal Audit Assignment, Revised SIA, Internal Audit Evidence and Revised SIA, Internal Audit Documentation. I am sure these Standards will go a long way in strengthening the internal audit function. Several Ind AS Changes Approved: In the national interest, ICAI aims to ensure India’s financial reporting framework remains converged with globally acceptable IFRS Standards at all times. In line with that spirit the ICAI council in its latest meeting has approved several Ind AS covering latest developments in global financial reporting world. These include robust high quality new standard on Insurance Contract viz. Ind AS 117, Amendments to Ind AS 109, Financial Instruments: Prepayment Features with Negative Compensation, Amendments to Ind AS 28, Investments in Associates and Joint Ventures: Long term interests and Amendments to Ind AS 19, Employee Benefits: Plan Amendment, Curtailment or Settlement. We have also approved Annual Improvements to Ind AS (2018) Corresponding to Annual Improvements to IFRS Standards 2015– 2017 Cycle issued by the IASB (IND AS 103- Business Combination, Ind AS 111-Joint Arrangements, Ind AS 23 – Borrowing Costs). Live Virtual Classes: I am happy to announce that a long-pending demand of our students for a standardised academic delivery system has finally been fulfilled. The Live Virtual Classes of ICAI with affordable cost and effective knowledge delivery has started for both Intermediate and Final course students on pan-India basis. To facilitate students to attend, these classes have been scheduled beyond office hours, i.e. from 7 am to 9 am and then from 6 pm to 8 pm. Students have been provided a login ID and a password to view the Live Virtual Classes lectures on their PC/ Laptop/Mobile and raise their queries at the same time. I request my professional colleagues to inform and advise their respective articled assistants and students in their contact, to make best use of this initiative. Proprietorship Form Registration Now a One- Day Affair: I am happy to inform that our members holding full-time Certificate of Membership, will now face no more manual hurdles in getting the selection, registration and approval of their firm’s name. The complete procedure has been rationalised and made online to save the precious time of our members. Very soon, this service will be launched and functional. Representation to CBDT on Revised Form 3CD: As members are aware, CBDT had recently issued a notification in relation to the revised Form 3CD, wherein among other changes, clauses/ sub-clauses have been inserted and major amendments have been made. In response, ICAI has submitted certain modifications in the revised Form 3CD in line with the spirit of tax audit. It has requested the CBDT to implement the new form from the assessment year 2019-20, so as to ensure the smooth and timely compliance. Then, for members’ clarity, a live webcast on Clause-wise Analysis and New Requirements in Revised Form 3CD of Tax Audit Report was organised on 13th August 2018, where my Central Council colleagues CA. Tarun Jamnadas Ghia and CA. Madhukar Narayan Hiregange, among others, addressed the matter. Rising Popularity of ICAI’s Virtual Platform for Learning: As you know, we had recently launched an E-Learning - Virtual Centre for Learning and Excellence to foster virtual learning, wherein various e-learning courses on contemporary professional topics by eminent experts have been made available to support our members to earn CPE credit hours through unstructured CPE learning activities. I am happy to share that, till now, more than 5300 users have viewed the lectures through about 1.75 lakh minutes. Interested members may visit www.icaielearning.org for further details. Convocation for Newly-Enrolled Members: First round of Convocation 2018 for the members enrolled during 1st November 2017-31st May 2018 is being organised on 2nd September 2018 in Ahmedabad, Mumbai, Pune, Chennai, Hyderabad, Kolkata, Jaipur, Kanpur and New Delhi, under the aegis of five Regional Offices. A total of 9,843 newly-enrolled members are likely to participate in the Convocations. Results Declared: Results of the Chartered Accountants Intermediate Examination (Old Course & New Course) held in May 2018 were declared. In the Intermediate (IPC) and Intermediate (New Scheme) examination, Ms Deepa Jain from Delhi and Ms. Sakshi Airan from Indore secured the first rank with 81.43 per and 83.63 per cent respectively. In Intermediate (IPC), Mr Lakshmanan A. from Coimbatore and Mr Parth Gupta from Delhi, and in Intermediate (New Scheme), Ms Radhika Chauthmal Beriwala from Surat and Mr Akshit Agarwal from Jaipur secured the second and third rank respectively. I congratulate all of them and those, who have passed in the both Intermediate examinations. Recently, I inaugurated and operationalized the 164th branch of ICAI in Bulandshahr, i.e. Bulandshahr Branch of CIRC (Central India Regional Council of the Institute). And, you will be happy to note that it was inaugurated using the office of WIRC in Mumbai, leveraging the technology at the Institute. Then, I also inaugurated the building of Bareilly Branch of CIRC, where I was accompanied by my Central Council colleagues CA. Manu Agrawal and CA Mukesh Singh Kushwah. I am sure, the infrastructure will give further boost to the professional endeavours of the Institute. I wish to inform that it has been proposed to empanel the members as Observers for the forthcoming November- December 2018 CA examinations, scheduled as Foundation, Intermediate-IPC/ Intermediate and Final Examinations under existing and revised scheme. For eligibility criteria and other details regarding the empanelment, interested members may visit http://observers.icaiexam.icai.org, and apply till 10th September 2018. ICAI during May-June 2018, held workshops for examiners at various cities across India and sensitized them about the evaluation assignment. At the workshop, examiners evaluated sample answer books under supervision and guidance of the Head Examiner/ Associate Head Examiners. All participants found these workshops useful and realised that such initiatives would go a long way in improving the quality of evaluation. It was also recommended that these initiatives should continue in future. The next elections to the Council and the Regional Councils of the Institute of Chartered Accountants of India are scheduled to be held on 7th and 8th December 2018 in the cities that have more than 2,500 members and on 8th December 2018 at all other places in terms of the provisions of Rule 21 of the Chartered Accountants (Election to the Council) Rules, 2006 as specified by the Central Government. In the developing countries, compliance of law many a time is slow, which also entails hardships. We as professionals while representing to the Government should advise our clients and stakeholders that they should come forward for relevant compliances at the earliest possible time, rather than waiting till the fag end of deadline. This will help us plan and execute our assignments in the given/ allowed timeframe, and help mitigate unnecessary stress that last-moment system slowdown or technical glitches might bring in. Let us not forget the preamble of our Constitution that recommends us to preserve the Sovereign Socialist Secular Democratic Republic character of our country and help our country secure Justice, Liberty, Equality and Fraternity to our fellow citizens. Let us understand the meaning of the supreme recommendations of our Constitution and act according to them. The month of September includes, apart from Teacher’s Day (5th September), the celebrations of Janmashtami (3rd September) and Ganesh Chaturthi (13th September). It is also considered auspicious due to the observance of Muharram (21st September), which marks the beginning of the Islamic New Year. Let us celebrate and observe all the aforementioned days in the spirit of our Constitution.